This Journal page will be used for ongoing thoughts on my professional life, and perhaps occasional observations on life in general. Books, movies, recipes, cds, dvds could get a mention. In other words, anything that strikes me as 'blogworthy'. If anyone reading these items would like to add their own observations I would be delighted. Please to send. After almost 50 years as a professional musician I have decided to retire, hang up my fingers, call it quits and begin a new phase of my fortunate life. Although I do not have an exact date yet (I'm working on it) my last performance for the paying public will be towards the end of 2020. For a while I thought I would not say anything and just quietly fade away - still an attractive option - but my musical life has been given to me by my beautiful New Zealand audience and it only seems right to let them know. To have a talent and to have a career are not the same thing, but from the very beginning people wanted to hear me play as much as I wanted to play to people. I had played all over New Zealand before I went overseas for the first time and the audience continued to grow with each return visit. They have never gone away. Since I came back permanently to live in the early 80s they have been almost my only audience and I love them with the full strength of my grateful heart. To find year in and year out that they are still there has impacted on my life in two ways in particular. Firstly it has affirmed my musical spirit. Although I use my cognitive brain when I prepare my musical performances, nonetheless the substance of those performances is entirely instinctive. I have always trusted my musical intuitions and my audience has said "Way to go, Michael!" When one's preparations are made in solitude this is truly a most important affirmation. Secondly, that the audiences should continue to show up in considerable numbers has made me a good bet for the people who put on concerts. This means that I have been able to make a living as a soloist and chamber musician and have not had to look beyond my performances for income. How wonderful! I was not cut out to teach and it has been a great blessing not to have to. And now I am a pensioner and the pressure is off. I could mention a third thing that I owe to my audience and that is my repertoire. I resolved early on to always offer something new (at least to me). And so year after year I have prepared new recital programs, new concertos, new chamber works. This has been personally rewarding in a great many ways and I like to think it has been a way to pay back some of the loyal support that has sustained me. I have played (often many times) in Invercargill, Tuatapere, Gore, Balclutha, Dunedin, Queenstown, Wanaka, Timaru, Ashburton, Akaroa, Christchurch, Greymouth, Motueka, Nelson, Blenheim, Wellington, Lower Hutt, Upper Hutt, Paekakariki, Waikanae, Otaki, Featherston, Martinborough, Masterton, Palmerston North, Feilding, Wanganui, New Plymouth, Te Awamutu, Hamilton, Putaruru, Waipukurau, Havelock North, Hastings, Napier, Gisborne, Opotiki, Whakatane, Rotorua, Taupo, Tauranga, Cambridge, Manukau, Auckland, Takapuna, Warkworth, Whangarei, Kerikeri, Kaitaia. This year I'll add Norsewood to the list. And I could mention a tin shed outside Timaru somewhere where I played the Goldberg variations on the longest hand-built piano in the world. Time to fold up the tent. “At the time of my father’s death (in 1999) I was spurred to examine the enigma of Nicolaidi, the strange surname I had carried from birth, and to grapple with the slippery concept of personal identity. I made many journeys - some purely of the mind, and some external and more physically demanding for the hard research. Destinations included the UK where my father was born, and Turkey and Greece at the edge of the Oriental and European worlds. 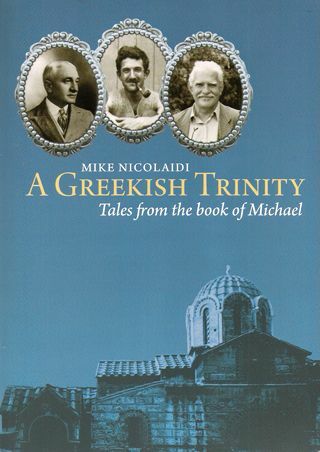 It was from the Eastern Mediterranean region that my Nicolaidi grandfather, whom I never knew, most probably sprang. All three of us were Michael. On October 15 2013 I played an all-Beethoven sonata recital at the Regent on Broadway in Palmerston North. I had played the same programme three days previously and was very happy to be playing it again. The first sonata - in E flat Op.7 (such a muscular nobility, full of the warmth of Beethoven’s humane spirit) - went well. The first two movements of the unfortunately nicknamed ‘Moonlight’ sonata also went well (the sublime Adagio sostenuto a meditation on the stillness and silence of Death itself - the sting is felt but without any romance). I then began the desperate finale. At some point during the repeat of the exposition a flash went off. “Oh no”, I thought, “let it be only once”, but before that thought was completed it went off again and I stopped. I stopped for one reason and that reason was the likely consequence of not stopping. I could have carried on. The music is in my hands and fingers, I can play it half asleep. But if I had not stopped the flashing would have continued, perhaps even escalated as other patrons got the idea it was okay. When a performance is going well there is a phenomenon that occurs in the hall, a phenomenon which can never occur when a music lover is listening to a CD or watching a DVD. A silence of a very particular order descends, a galvanized silence, and everyone is present and attentive in a way that is hardly possible in ‘ordinary’ life. The music takes on a life of its own and its meaning (a dangerous word, but not entirely wrong) is enhanced. The performer responds to the atmosphere in ways that they can not anticipate – spontaneous discoveries and other felicities suddenly appear. It is the proper concert experience – when the whole is infinitely greater than the sum of its parts - and the unspoken hope of it is the reason audience members part with their money to buy tickets. But it is a fragile thing. The bright red vibrating flash of a smartphone camera obliterates everything that has been built up to that point. The attention of the entire audience moves from the music – the business at hand – to the interruption. On the stage it is as if all the air has suddenly been sucked out of the room. I was furious because I was forced to stop. And my fury was sufficient to have me address the miscreant and to make me leave the stage. When I returned to play the second half of the concert I was greeted with sustained warm applause, applause that was saying not only ‘welcome back’, but also, I believe, ‘good on you’. I see myself as a pretty level-headed artist – much less ‘tortured diva’, much more ‘10% inspiration, 90% perspiration’ – and it takes quite a lot to throw me off my stride. But I will go out of my way to protect the concert experience. Unless you are given to meditation at the highest level, it is perhaps the only situation in daily life where the realms of the transcendental can be breached. Beethoven suggests as much when he says, “Music is a higher revelation than all wisdom and philosophy”.